I love thin woollen sweaters. I looked through my stash and found yarns from many decades. Some as they came from the yarn shop, some dyed by me, some handspun. Here are some of them. I have enough for a sweater! Needles 2,25 mm. No definite plan, I knit as it pleases me. May 1, 2016 - 3:32 pm Marilyn F.
You are a busy knitter creatively using up your colorful stash!!! Something I think we all hope to do someday. Are you going down memory lane remembering what you originally spun or knit the original yarn for? 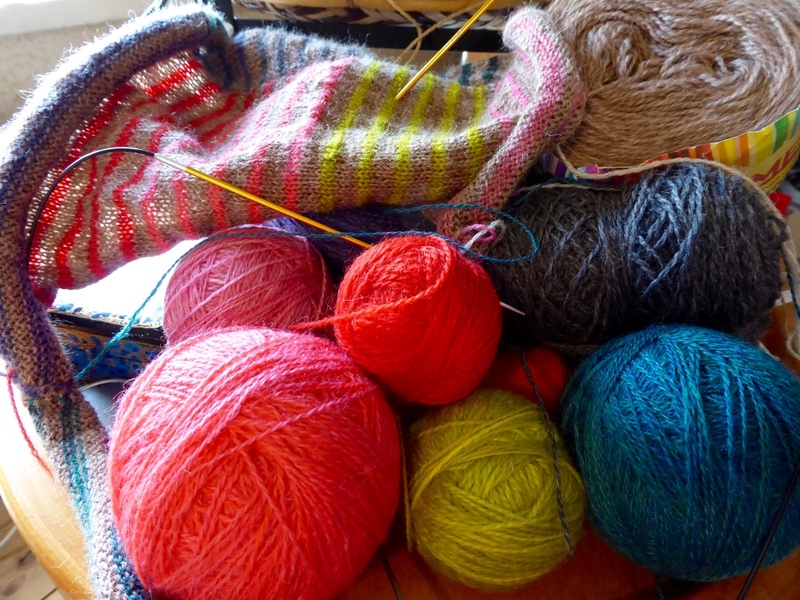 And how is it to knit with your handspun yarn and commercial yarn in the same project? I assume they are similar weights, but do you get a little different gauge between the two and have to change needle sizes in small increments to get the same gauge? The yarns are pretty similar in weight. I often use commercial and handspun yarns in the same projects, and there hasn’t been any problems. I use the same needles all through. Knitting is forgiving! If I’d knit one sleeve with one yarn and the other with a different yarn I’d probably have problems, but not when knitting this way, i.e. narrow stripes. May 1, 2016 - 6:35 pm Marilyn F.
Ah, it sounds like you are very consistent in the yarns that you like and use whether they are handspun or commercial. That’s great – certainly makes it easier for you.